The figures demonstrate a huge leap in popularity for the annual summer event as last year its ticket sales reached 73,426 for the entire booking period. This year Kids Week is running to coincide with the London 2012 Festival, the spectacular 12-week nationwide celebration running for the duration of the Olympic and Paralympic Games, and allows children under the age of 16 to attend the theatre for free when accompanied by a full paying adult for the whole of August, as part of a scheme to encourage young people to embrace the magic of London's West End theatres. In the first 24 hours of booking alone for Kids Week 2012, an exceptional 42,232 tickets were snapped up, with still over seven weeks of booking remaining. Julian Bird, chief executive of the Society of London Theatre, said: "This is an incredible achievement for Kids Week and a sign that families are eager to travel to London this August to see a show. "Every single West End theatre is programmed over the summer and we look forward to welcoming thousands of excited families to see the huge variety of shows on offer." This is a huge accomplishment, as with the Games being showcased in London this year, it shows that families are undeterred by the two weeks of Olympics and are fleeing to the theatres for the live performances. To celebrate this special Olympic year SOLT have extended the promotion from one week to one month. Spread over four years, it is designed to give everyone in the United Kingdom a chance to be part of London 2012 and inspire creativity across all forms of culture, especially among young people. 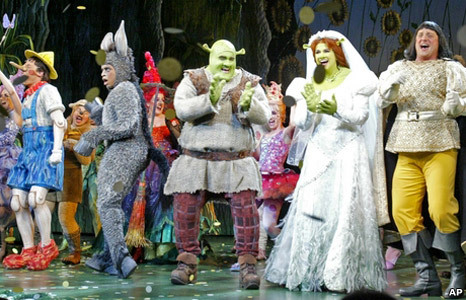 Kids Week was launched last month by comedian and television presenter Richard Blackwood at the Theatre Royal, Drury Lane and has an impressive array of shows including Shrek the Musical (pictured above), The Wizard of Oz and Billy Elliot. Alongside the 38 theatrical performances on offer, children have the opportunity to indulge themselves behind the curtains of their favourite plays with question and answer sessions with cast members, backstage tours, and song and dance workshops. There are still many tickets available for top shows including The Wizard of Oz prequel Wicked, Spamalot, which stars TV star Todd Carty, as well as the Olympic-themed Chariots of Fire. Kids Week is just one of the many initiatives SOLT are providing this summer to engage visitors into London Theatres, along with West End Live, The Olivier Awards with MasterCard, and TKTS ticket booth, the Official London Theatre guide. For more information and to buy tickets click here or telephone 0844 248 5151.